When it comes to attracting future employees, the senior living industry may have its work cut out. In total, the industry will have to attract more than 1.2 million additional employees by 2025, according to Argentum’s new report, “Getting to 2025: A Senior Living Roadmap.” The report, which was produced with input from hundreds of top senior living executives, thought leaders, advocates and policy experts, analyzes the current landscape of senior living care, as well as provides a 10-year industry outlook. “Anything we can do to encourage people to come into the industry, and stay in the industry, will be critical going forward,” Argentum President and CEO James Balda tells Senior Housing News. Argentum’s overall take on the industry and its workforce was informed by a six-month listening tour spent meeting with experts and advocates for seniors in a variety of professions. Over the course of the six months, Argentum hosted between 25 and 30 sessions across the country, Balda says. The senior living industry will create 347,000 new jobs by 2025, pushing total industry employment to more than 1.1 million, Argentum predicts in the report. Current projections predict that senior living operators will have to fill 900,000 positions over the next 10 years as current workers leave their jobs. In total, then, the senior living industry will have to attract over 1.2 million more workers by 2025. The state that will require the highest number of these workers is California, the report says. The state is anticipated to need more than 136,000 senior living workers in 2025. Florida, meanwhile, is expected to need approximately 130,400 senior living workers by 2025. Texas is expected to need around 83,000. A variety of senior living jobs will be in demand across the country from now to 2025. Specifically, the industry will require more than 460,000 nursing assistants and home health aides and about 25,600 registered nurses. It also will have to attract and retain thousands of positions in personal care, food service, administrative support and building maintenance. In order to succeed in creating an adequate workforce by 2025, the senior living industry will have to make senior living working environments and career paths attractive to future workers, the report says. Establishing professional credentials to heighten the status of a profession in the eyes of prospective workers, and partnering with institutions of higher education to encourage them to promote and expand programs and certifications in senior housing management, may help. Argentum is currently looking at partnering with several institutes of higher education, Balda says. The organization already partnered with the University of Southern California to host an executive management program, and it has sent requests for information to almost a dozen other universities to look at how their curricula could potentially align with the senior living industry. 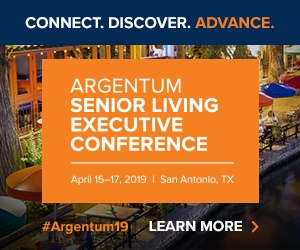 In addition to workforce development, Argentum identified four other key issues it believes the senior living industry will face over the next 10 years: operational excellence, quality care, memory care and consumer choice. Argentum plans to concentrate on these five imperatives to create new partnerships, initiatives and goals to guarantee the nation’s aging population can experience choice, innovation, quality service, respect, independence and dignity, the report says.